The NESCO EC-10 is a 400-watt stainless steel egg cooker. It includes cooking tray which holds up to 8 eggs in shell for hard, medium or soft boiled cooking. This cooker has attractive stainless steel wrap and see through lid. A buzzer sounds when the eggs are ready. It also comes with a 3 compartment poaching tray, cup for measuring water and device to prick eggs before cooking to eliminate cracking. 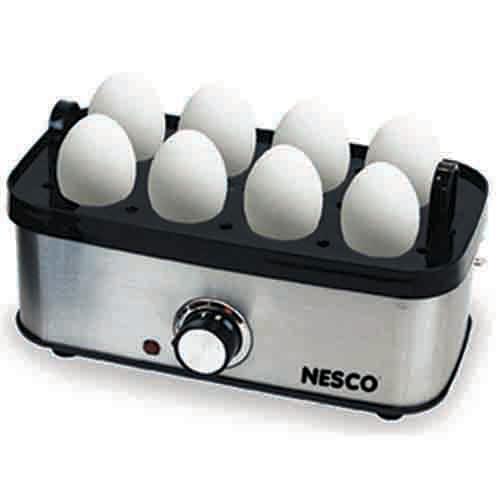 The Nesco Egg Cooker has many exciting features for users of all types. 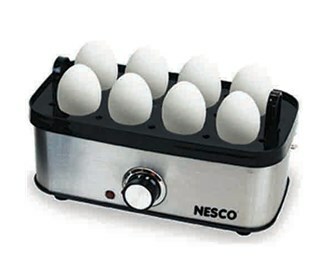 See the Nesco Egg Cooker gallery images above for more product views. The Nesco Egg Cooker is sold as a Brand New Unopened Item.